Geometry is that branch of mathematics which studies the properties of figures such us lines, triangles, quadrilaterals etc. many years in advance of their occurrence. 1. Can you divide the below mentioned line segment in to two exact parts without using the scale? 2. What should be the size of underground tank to store petrol/milk and water supplied through tankers? 3. Why do people who prepare sweets, makers cut the ‘burfi’ in the shape of parallelograms rather than rectangulars? In geometry we find answers/solutions to above mentioned concepts/problems. 6.1.1. Construction of Perpendicular to a line from a point. Step 1: Draw the line AB of given measurement and C be an external point. (If necessary extend the line) X, Y as shown in the figure. point Z on the other side of AB. CL is perpendicular to AB. 6.1.2. 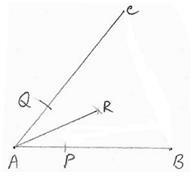 Construction of Perpendicular bisector to a line. Step1 : Draw the line AB of given measurement. Step2: With A, B as centers, draw arcs of radius more than half the length of AB on both sides of AB. 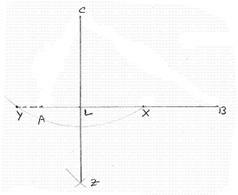 Let these arcs meet at X and Y.
Step3: Join XY to meet AB at L.
6.1.3. Construction of Angular bisector. Step1: construct CAB of given measurement using protractor. Step2: With A as center, draw arcs of same radius to cut the sides AB and AC at P and Q respectively. Step3: With P and Q as centers as and with more than half of PQ as radius, draw arcs to intersect at R.
Locus is the path traced by a moving point, which moves so as to satisfy the given condition/conditions. An example is the circumference of a circle. Any point on a circumference is at equal distance from the center of the circle. Thus circumference is locus of circle.